This film of me underwater was taken by my brother Alan one day in April as the ice was breaking up on Lake Huron in Ontario, Canada. 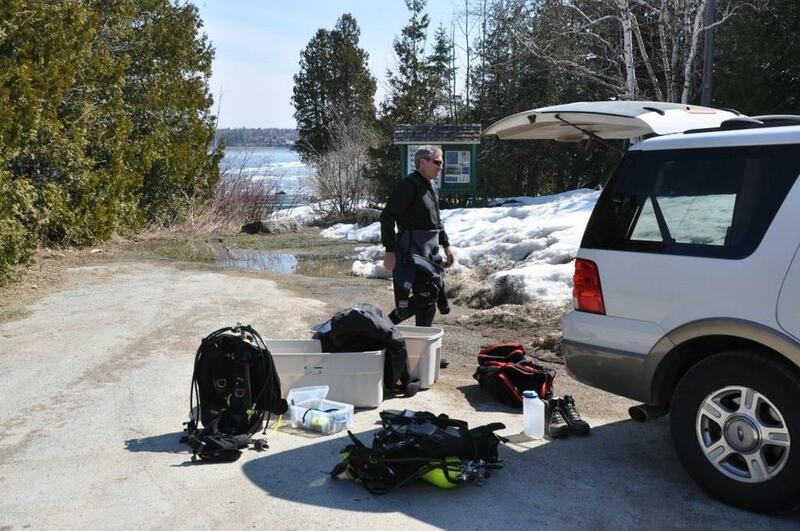 We’d driven the four hours from our farm up the Bruce Peninsula to Tobermory and Fathom Five Provincial Park, a favourite dive spot of ours because of the number of well-preserved shipwrecks there of the 19th century. We’d had a great experience the previous spring diving under the lip of ice remaining on the shoreline – the dives that produced the photo of me on the homepage banner of this website – and we wanted to try it again, this time in the hope of finding more extensive ice cover and making a film. As the photography shows, we were in luck – the weather and the ice were perfect, and the two dives we did that afternoon are among the most memorable of my entire diving career. We’d originally intended to dive on the site of the anchor shown on the contacts page of this website, in deep water off the rocky shoreline where I took the photo to the left. But our usual entry point lay well in from the edge of the ice flow, and with the north-easterly wind that day pushing the ice inshore there was a danger that the chunks would compact together and form a continuous cover, with no easy escape route. So instead we opted to go across the bay to Lighthouse Point, which by chance was on the edge of the flow. There’s no wreckage off the point, but interesting limestone topography with overhangs and rock walls that drop off to considerable depths, often with stunning underwater visibility. As it turned out, it wasn’t the geology that provided the main backdrop to the film but the ice itself. In the past when I’ve dived under continuous ice of uniform thickness the view can be a bit gloomy, with the entry hole providing the only vivid sunlight. That day at Tobermory though was a revelation: the shifting chunks of ice created a latticework of cracks and pools where the light could get through, and the varying thickness of the ice meant that the light was further differentiated and refracted. The result was a truly dazzling dive experience. One of my favourite parts of the film is about half way through where Alan dropped down into deeper water to film me slowly rising towards a pool of light, surrounded by chunks of ice that look like clouds. The chunks were miniature icebergs, larger and more variegated underwater than they appeared on the surface, and by inverting and injecting air into my buoyancy jacket I was able to bounce across them upside-down, an extraordinary, otherworldy experience that is also captured well in the film. At the end of the second dive in the late afternoon we surfaced with the water freezing up around us – you can see it happening in the film - and the shards of ice cracking and popping as they formed. One of Alan’s gloves had leaked – he took part of that film with one hand numb with cold – and my regulator had frozen after I’d surfaced momentarily and taken a breath through it in the sub-zero air, causing the piston in the first stage to seize up. These last pictures were taken after I’d put on my mask again and used my backup regulator to drop down a few metres to retrieve a lead weight. We'd spent over an hour in water that was only one or two degrees above freezing. We hope to be this lucky again with the conditions at Tobermory and to dive beneath a floe at night, ideally under a full moon. Watch this space!